Global cuisine served in a striking, hip social lounge. 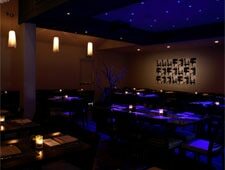 : Flight Bistro & Social Lounge is both a fine dining restaurant and late-night club scene. The interior is surprisingly sophisticated from the eye-opening grand brass door to the natural quartz bar to the modern color palette in hues of deep blues and grays. Chef Derrick Hamilton is now overseeing the innovative and flavorful menu of global tapas plates and mains. Order up some killer signature cocktails or a glass of wine and a few plates to share with friends. We enjoy the fried chicken (garlic mashed potatoes, cranberry barbecue sauce), "truffled" macaroni and cheese and the frittata with sweet Italian sausage. Entrées feature flatbreads, Kobe burgers, salads and pasta dishes. At meal's end don't miss the chocolate flight (pot de crème, molten chocolate cake, fresh-baked chocolate chip cookie). Because this is a hot night spot, items on the tapas menu are half priced until 8 p.m. The wine list here is somewhat extensive with lots of well-chosen selections from around the world.